Price listed is for fourteen glass stones. 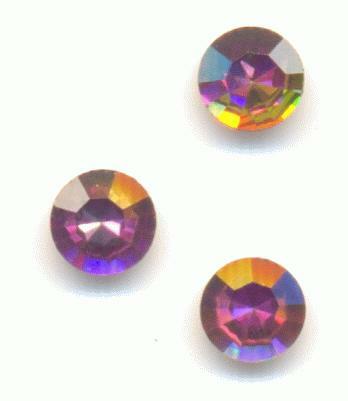 These are 32pp (4.0-4.1mm) Swarovski rhinestones. The color is fuchsia with a special effect coating over the top. The coating is not an AB finish, but has a green tourmaline shine over the top of the fuchsia stone. They have faceted tops and pointed gold foil backs.